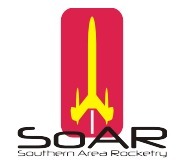 Southern Area Rocketry is the National Association of Rocketry charteredclub for model rocket enthusiasts in Atlanta andNorth Georgia. We provide a proving ground fortechniques, training, and safe launch support.SoAR welcomes all ages and skill levels. Nashville, GA A two-day , high power launch at the GRITS field in Tifton! Pack some leftover turkey sandwiches and come on down for a weekend of rocket flying! 18k waiver! Tifton, GA Two day event.